I have attended many workshops over the years, but this was by far the best teacher workshop I’ve ever been to. The hands-on experience and the take home materials were amazing. The world is your classroom: The working farm is a venue which provides nearly limitless learning opportunities. For example, did you know cows are herbivores; therefore, they only have teeth on the bottom of their mouths? Or did you know that one bale of cotton produces 313,600 $100 bills? 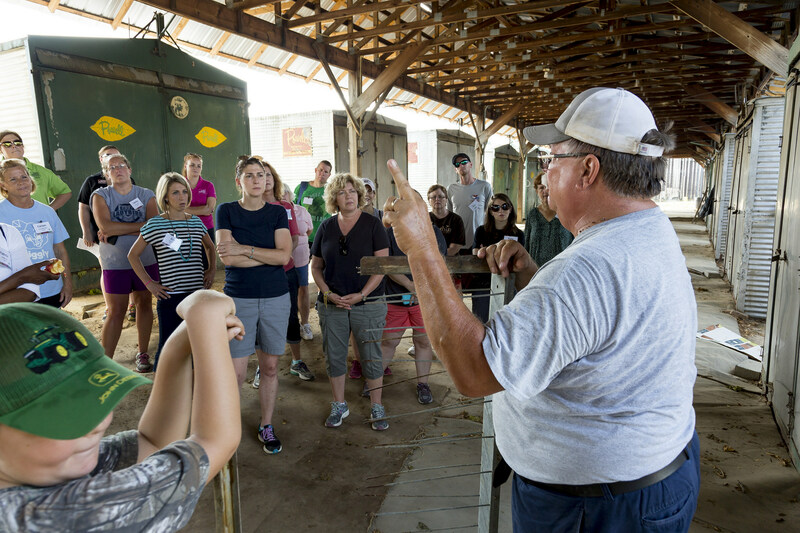 By incorporating elements of farm life, our workshops try to inspire new ways of teaching familiar concepts. And each workshop is tailored to the top agricultural products grown locally, so the experience is relatable and translates naturally to the classroom. Each teacher who attends a workshop will receive a backpack full of materials and resources ready to use in their classrooms, a thumb drive filled with grade specific lesson plans, and .7 CEUs for updating teaching certifications – along with gaining a better understanding of how North Carolina farmers raise and produce our food and fiber. Below is a brief outline of our upcoming Going Local Workshops (registration is linked in each header). Apple Hill Farm has been in operation for over 15 years. The farm started as a passion project for the owner, and now serves as a popular Agritourism destination, featuring alpacas, llamas, goats, and donkeys. The NCFB AITC team will focus on Christmas Trees, Family Farms, and Animal Fiber. Wayne E. Bailey Produce Company is a fourth generation family business. The farm started as a strawberry farm, but eventually the focus turned to sweet potatoes when president and owner George Wooten saw the potential for sweet potatoes to be marketed year-round. The NCFB AITC team will focus on Edible Roots, Strawberries and Family Farms. Registration closes June 13th. This workshop will only accept 30 participants. The day will start with w tour of a fish research facility and will end with professional development at the Watson College of Education at UNCW. New Hanover County native, 2016-17 Kenan Fellow and NCFB AITC’s 2017 Teacher of the Year, Stephanie Titzel will join this workshop. The NCFB AITC team will focus on Bees, the Greenhouse/Nursery industry, and Aquaculture. Byrd Farms began in the early 1900s. James Michael Byrd is a seventh generation farmer and farms alongside his parents, R.H. and Sherrie. R.H.’s grandfather served on the National Cotton Council in the early 1900s, and would often travel to Europe to participate in commodity training! The NCFB AITC team will focus on Cotton, Soybeans and Family Farms. Wyant Farms is a fifth generation farm which began in the late 1800s. They specialize in wheat, soybean, corn, alfalfa, and cattle production. Jerry Wyant was named 2016 North Carolina Farmer of the Year. The NCFB AITC team will focus on Beef Cattle, Soybeans, and Family Farms. Why are Going Local Workshops Important? Agriculture is North Carolina’s #1 economic driver, but only 2% of the population is directly connected to farming. We must create new ways to teach young people where their food and fiber comes from and how farming plays a central role in our lives. Plus, working in today’s agriculture isn’t just plowing the field and getting dirt under your fingernails; it’s researching plant and animal biochemestry, engineering cutting-edge technology, refining best practices to improve production or sustainability, and even developing public policy to support our farmers. 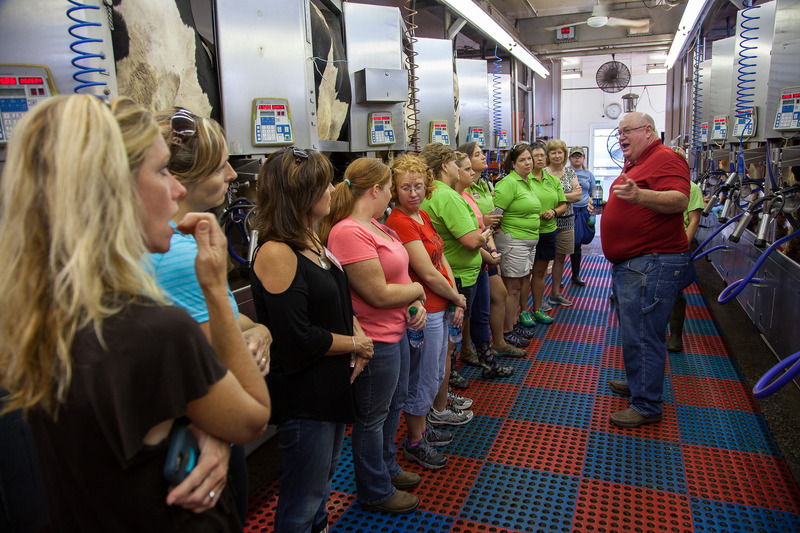 These AITC Going Local Workshops provide more than just information – they build real world connections within local communities and help teachers cultivate a strong agriculture foundation in their students. So use the HAPPENINGS tab from our website, www.ncagintheclassroom.org and sign up for one of our Going Local Workshops. We look forward to seeing you soon! Michele Reedy is the Director of the North Carolina Farm Bureau Ag in the Classroom program.